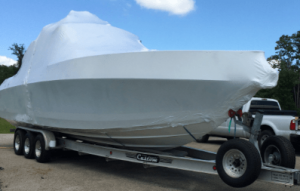 From shrink wrapping boats, ships and other vessels for transportation, protection or weatherization needed for your marine renovation project. Pro-Tect provides containments, weatherization and corrosion preventative solutions, services and materials during construction to isolate different crafts (painters and welders etc.) and weatherize complete decks/platforms to meet aggressive schedules during inclement weather. Protection and preservation of equipment during storage and construction process is also available. Allow our highly trained staff to assist you with your marine protection needs today. To learn more about how Pro-Tect Services can help you with your marine heat shrink wrap needs, please use the form on the right or you may contact us at: (713) 589-4638, fax (713) 589-5612, or email sales@pro-tectservices.com.